Designed by MLB player Brandon Barnes and implemented by artist John Anderle, this shirt was created to represent Brandon's personal style and story. 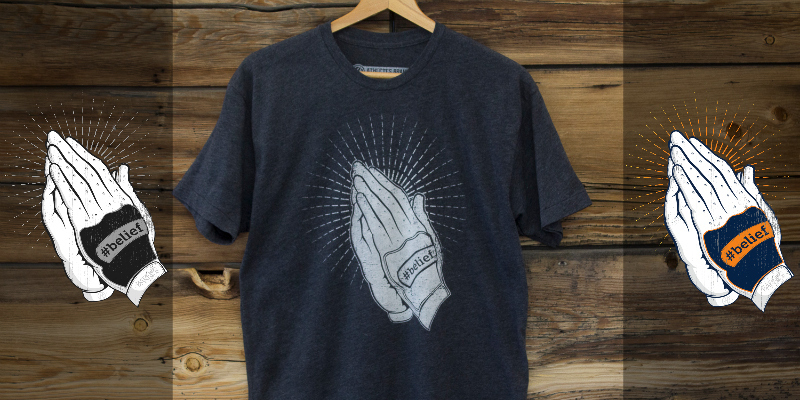 He hand drew this shirt in his sailor jerry style tattoo look to represent two baseball batting gloves in the praying hands form. That represents his faith and his career. The word belief comes from his story... His brother suffered from pediatric cancer at a young age and said the only way he made it through every day of treatment is because he had "belief" that he would one day beat the cancer... he has beat the cancer and is healthy and thriving. 10% of every sale of this shirt goes to support the Pediatric Cancer Research Foundation to help find a cure, and support families going through the hardships of treatment. Printed with white sublimation on a American Apparel Tri-Blend black t shirt.